Anxiety is a common emotion that we all share and, at times, it is actually useful. Its helpful functions are to alert you to danger or threat and to increase your awareness and motivation of a task that needs your attention (preparing for a presentation, or checking on your sleeping child). It is when anxiety gets out of control that it can become problematic and dominate the emotional state. 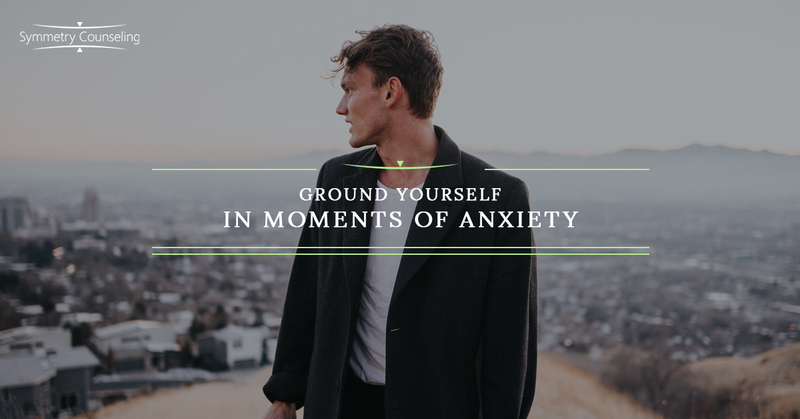 High anxiety can manifest in many different ways, yet a very common theme for most people suffering with anxiety is a sense of disconnection or distractibility from the present. This could be a feeling of “getting stuck” in worrying thoughts, an inability to concentrate, or feeling preoccupied with physical symptoms (a pounding heart, restlessness, sweating palms). Becoming present and bringing yourself back to a grounded state can diminish these physical and mental symptoms when they occur. Here are some easy to use, in the moment techniques to get grounded and get present when you feel pressured by anxiety. Sit in a chair with your back comfortably straight and both feet on the floor. Relax your arms and hands and close your eyes. Focus on the sensation of your feet firmly planted on the floor. Push down with your feet, noticing the firmness of the ground beneath. Press your fingertips together and gently, slowly roll your shoulders back a few times. Take a moment to notice and acknowledge your physical presence: the weight of your body on the chair, your arms at your sides or on your lap, tension in your face or neck. What else do you feel? Lastly, open your eyes and take a moment to stretch and move your body. Breathing from the diaphragm stimulates our body’s relaxation response. Continue this for about 1 minute. You can change the numbers you count to, just be sure to keep a steady rhythm and make sure you breathe slowly and deeply. With the use of some or all of these exercises, you should find yourself feeling calmer, more centered, and better able to continue on with your day with less distraction from your anxieties.